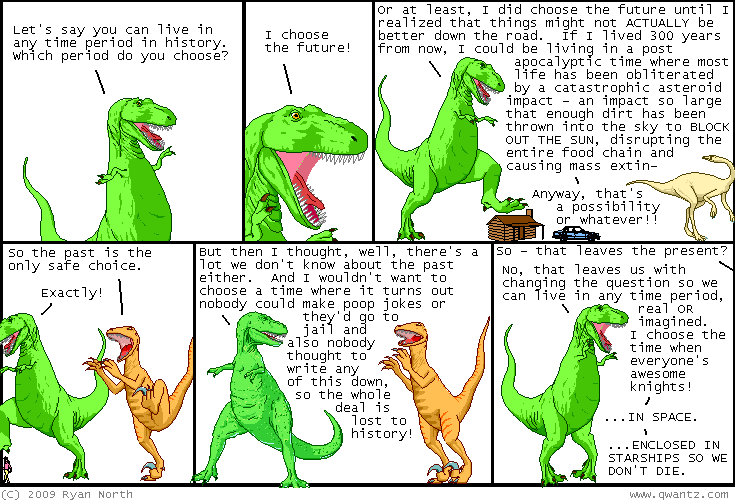 Dinosaur Comics - November 17th, 2009 - awesome fun times! November 17th, 2009: If you missed my Reflections | Projections talk, the tastefully-titled "GUYS, LOOKS LIKE IT'S WACKY TIME", and you still want to see it, then I've got some good news for you: the videos of all the talks are now online! You can watch all these (and more!) (and apologies to the speakers I grouped under "more", but I didn't want to go on forever!) on the videos page. Seriously, check them out! November 22nd: Deadline for USPS International First Class shipping! December 8th: Deadline for USPS International Priority shipping! December 15th: Deadline for USPS International Express and Domestic (US) First Class and Priority shipping! December 21st: Deadline for USPS Domestic Express shipping! So what this means is that if you don't live in the States, you should order soon to get sweet presents there in time for Christmas - no later than December 15th at the very latest, and that's with paying for express shipping. It's cheaper the sooner you order! If you live in the States you can push this a bit longer with the domestic shipping options, but you really shouldn't wait! Might I recommend... this rad T-Rex hoodie?